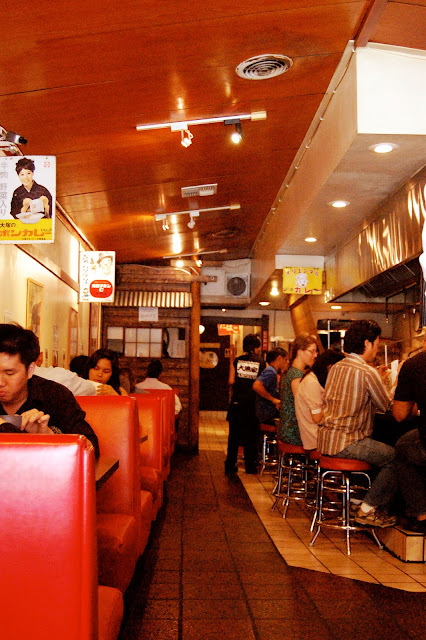 Writer, photographer, traveler, cook and college friend from days yonder, Dani Kando-Kaiser reports on some of her favorite Japanese eateries in Los Angeles. Most of our college days together entailed wall to wall laughter, music obsessions and 'free' burritos from the campus coffeehouse where she worked. Good times. She is currently getting ready to publish a photo-essay book this Summer, a children's fairytale entitled, Dream in the Desert. LA gets a pretty bad rap, doesn’t it? “It’s superficial, it has no substance, it’s so fake!” Having lived much of my life in Northern California, I’d heard all of these slights and more, but I’d always had a fondness for the impressive vastness, the muchness, of the never-ending city. Almost two years to the date that I’m writing this, my husband took a job in downtown LA, and while I had the same mixed emotions we all have when we leave good friends and an established life, I was totally unprepared for what was to come – I feel head over heels in love. Yeah, I have a massive crush on LA, and it has everything to do with the fact that it’s NOTHING like I thought it would be. For instance, that side of town where the bubbly blonde billionaires live – that’s also home to the second largest population of Ethiopians in the US and it’s where I had the best Doro Wat of my life. But, I live on what we call the East Side, where we have the largest Chinese and Thai populations outside of those two countries, as well as the largest concentration of Central Americans in the US, and this makes for the most diverse collection of restaurants you could imagine. And, when you add to this both the competition of having so many restaurants and the abundance of fresh, locally sourced, and healthful ingredients – LA really is a culinary wonderland. One of my favorite cuisines is Japanese and one of my favorite places for lunch is the tiny and adorably scruffy Daikokuya ramen house in the Little Tokyo neighborhood of Downtown LA. It’s warm and dark, and decorated in old Japanese movie posters, the waiters are all friendly Japanese punk kids, and the ramen is flawless. The noodles here are totally fresh and served al dente, and the gorgeous little soft-boiled egg (my favorite part, so I ask for an extra one) is marinated for extra flavor. But, the star of the show is the broth. OMG that broth!!! 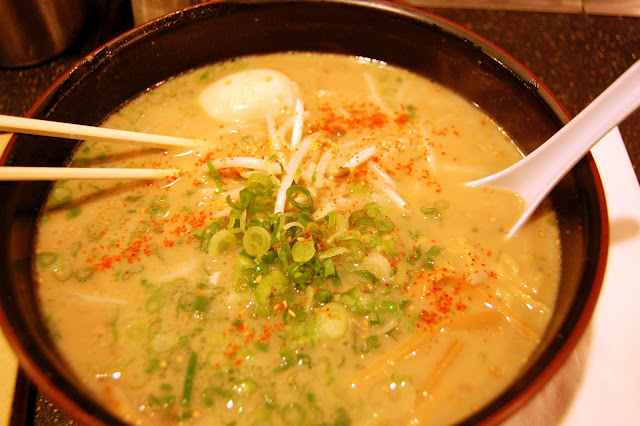 It’s incredibly rich and creamy, due to the fact that they let high quality korubuta pork, bones and all, simmer for several hours. Some folks choose to add koteri (pork back fat) to their ramen, which isn’t my thing, but makes for an unarguably decadent treat. Me, I just add some of the fresh garlic and ginger that comes with the ramen, as well as a couple dashes of red pepper, and I’m in total ramen nirvana. After I waddle out of Daikokuya, I head a few doors over to the adorable sweet shop Fugetsu-Do. 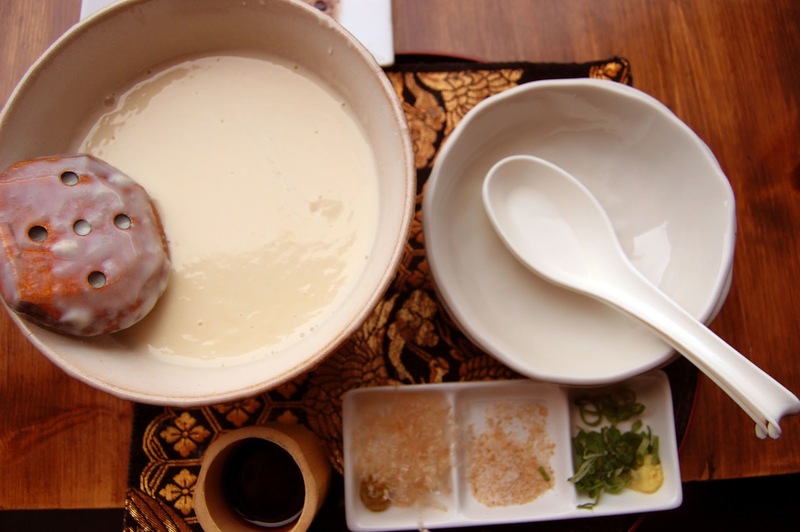 Owned and operated by the same family since 1903, Fugetsu-Do has an amazing history and is just a joy to visit. 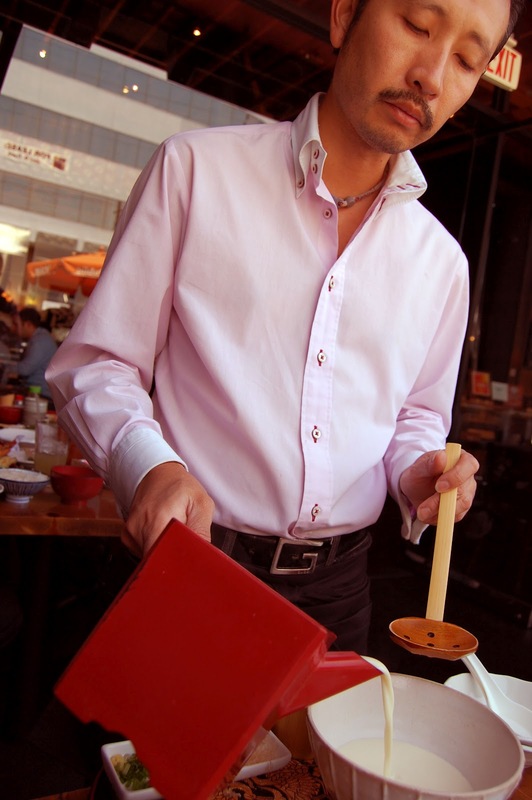 The very affable owner, Brian Kito, loves to talk about his mochi and is the creator of one of my favorite things to eat in LA – a cup of fruit-flavored shaved ice with little pieces of chopped mochi. This treat is only served in the summer, but at any time of the year, you can choose from an amazing array of beautiful, fresh sweets. In my house, we love the tiny jewel-like chrysanthemum mochi. And the strawberry mochi filled with just a touch of peanut butter. On the other end of LA, near the wonderful Original LA Farmers Market, is the lively and addictive Robata Jinya. Taking the traditional robata grill to the next level, Robata Jinya has an impressive number of unique items, all in small quantities, so that you can easily and inexpensively try everything you want to. 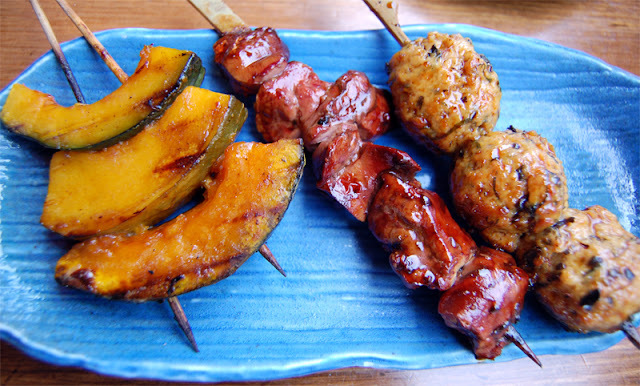 Recently, my friends and I shared the grilled foie gras, miso beef tongue, Japanese pumpkin, and lotus root. The foie gras and tongue were incredibly tender, the pumpkin was smoky and creamy, and the lotus root had a refreshingly clean snap to it. Also fantastic here is the sashimi. In a town that has far too many mediocre sushi restaurants, this is simply the best sashimi I’ve had. 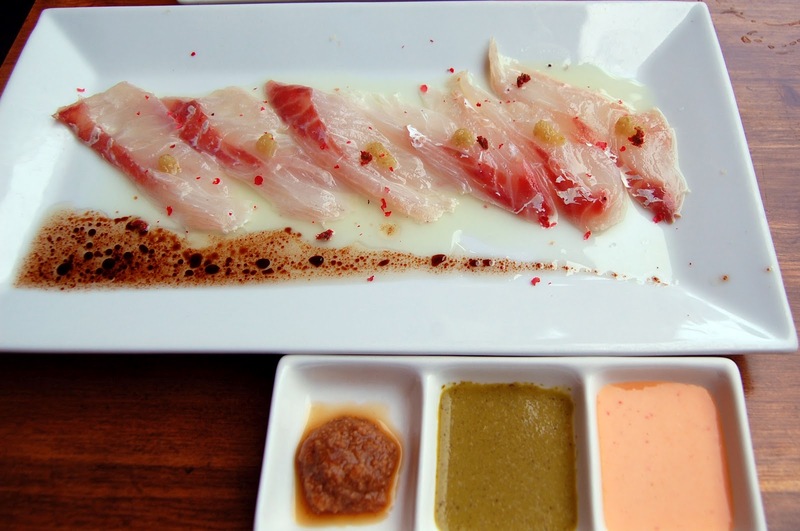 My favorite is the always-impeccably –fresh red snapper with citrus, yuzu and crushed pink peppercorns. oh man, I gotta try that tofu!